Hey there! I hope your week is off to a great start. Today I’ve finally got a new vlog to share. It’s one where I show myself cooking that kale and sausage soup recipe I mentioned a couple times last week. If you’re not already subscribed to my YouTube channel please click here to subscribe (it’s free)! The soup is REALLY good, I’m definitely going to be making it again soon. It didn’t take very long to make at all either which is really nice when you’re whipping it up on a weeknight. Last week I also mentioned wanting to re-read the Harry Potter series this year. I got started on Friday night and am halfway through Sorcerer’s Stone now. I bought the series for Kindle a few years back so I haven’t cracked open one of the actual books in a while. For a long time I only read books on Kindle, but over the last couple of years I’ve gotten back into reading physical books. The pages were a little stiff and discolored, which I guess is to be expected since the books are pretty old now. I’m glad I decided to read the physical books though. 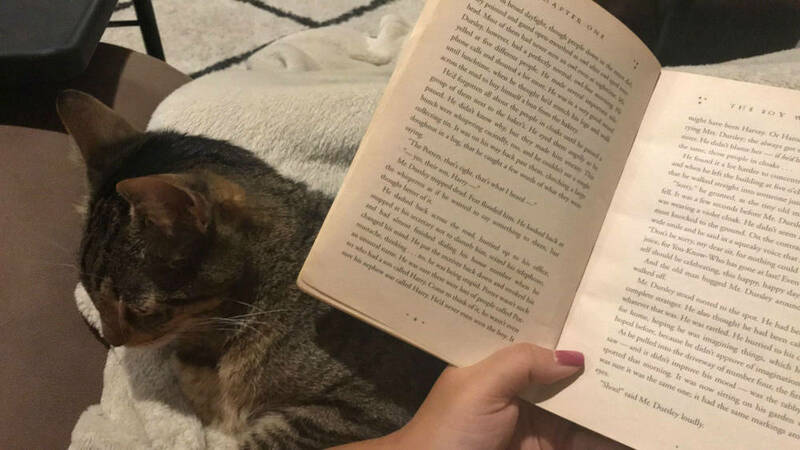 It felt so relaxing to curl up on the couch under a blanket with my book and Cecil on my lap. That’s a good Friday night. Saturday I had a gym date with myself so I don’t have any new video clips of that. I am happy with the upper body progress I’m seeing. The primary lift I did was bench press. Since Adam wasn’t there to spot me I just focused on going for high reps rather than high(er) weight. 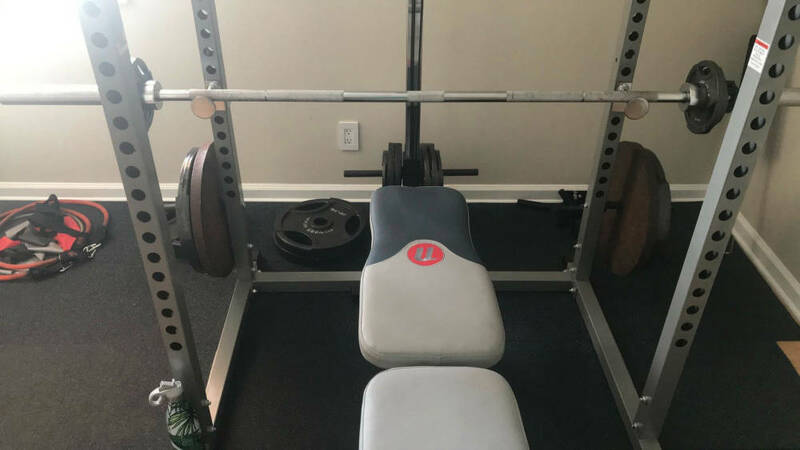 A couple weeks ago doing 8 x 60lbs felt hard, but yesterday 10 x 60lbs felt easy so I’m really happy with that progress on bench. I did a little bit of decorating in the gym this weekend too. I decided I really wanted to hang up my medals now that thinking about running doesn’t make me want to cry. I am so so so so hopeful about getting cleared to run this coming Wednesday. My incision looks great and from my point of view I think it’s time. *Fingers crossed* that my doctor agrees. I decided to hang them up around my bib holder. I love seeing them up :). So shiny, so beautiful, so representative of the hard work I put in on the streets training. I’ve totally forgotten what it’s like to be in the middle of a training plan. I’ve honestly forgotten what it’s like just to include running in my daily routine. I used to plan a lot of my weekend around my long run and now I’m living my life so wild and unconstrained lol! Let’s hope that I get cleared before this good running weather is gone until next winter. What a shame it would be to miss these 60 degree days. 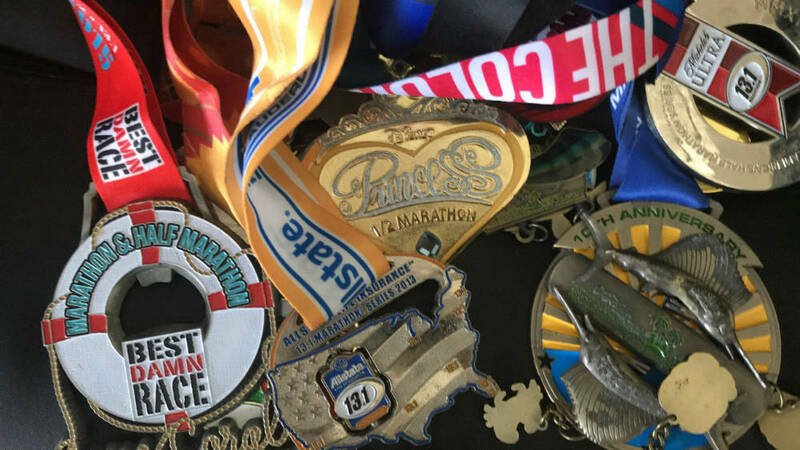 Do you hang your medals/bibs up? When was the last time you read the HP series? Your medals look beautiful! I wish I had a way to bench press but the only way I can do that is at the gym and it’s a smith machine so it’s just not the same. It actually doesn’t feel natural. We have to go to the store today and I’m going to make us food. That soup looks very good! Maybe I will make that. I do already have chipotle and monterey jack cheese chicken sausage in my fridge but I don’t think that would taste as good in the soup.